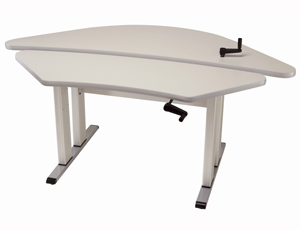 This Equity 4230CBL bi level corner height adjustable computer workstation by accommodates students of all ages and abilities. The corner design fits into standard 42-inch corners, working your space to its fullest potential (an ideal solution for integrating accessibility into computer labs with scarce floor space). Two easy-to-turn hand cranks provide infinite work surface adjustment between 24-34 inches to meet the functional requirements of students with disabilities and the requirements of the ADA. Two-Year Warranty. 42" x 42", 40" x 17"
Bi-Level Corner Computer Workstation w/ hand crank adjustment.